Nothing is making sense anymore! When I first started this blog just under a year ago, it was meant to be a hilarious diary of the stuff I encounter on a near daily basis whilst I experimented with writing. As it turns out….. it would seem that I have a rather eclectic style of writing. I don’t seem to be able to write in just one fashion. Trouble is, my friends have been on at me to write a book for years now and I can never come up with the story. I don’t have “A” story. I have several. I have been trying to merge all these stories in my head for months now and to come up with a “genre” in which I can pigeon-hole them and today I realised that I can’t. So maybe I don’t have a book to write. Maybe I just have several stories to tell…. hopefully some of them with a moral or best case scenario… maybe I’m sitting on a trilogy of books in my head. Today I went walking. 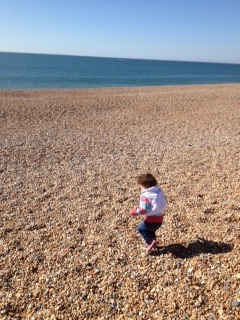 No easy feat when Toddler Child insists on walking with me…. so I wasn’t exactly doing the power walking for the training regime I wanted to do, but at least I was breaking in the walking shoes. Middle Child has gone off for the week and oddly, this leaves me feeling like there is a bit of a gap to fill, both physically and mentally. First Born also brought up the topic of cochlear implants last night which was quite profound and, over breakfast this morning, he made me watch a very interesting YouTube video which was even more profound. On my walk, I started hashing over some of the events of his early life on the back of the whole cochlear implant topic. I asked him outright if he thought it was something he would want now. His response was “No. It’s just good how deaf people are more accepted now”. And it’s true. I remember back when he was a tiny baby, it was rather taboo to be “different”. I don’t like using the word “disability” because it’s never a disability unless you allow it to be. It may make things more challenging, but owning your “difference” can make all the difference. It’s the people and society around you that are disabled! When I was first letting people know that Josh was deafblind, the first things they would ask is what surgeries he could have to FIX that. Also, in some circumstances they treated him like he was contagious. People would stare, stay on the other side of the room and keep looking at us but not talking to us. I would avoid the mother toddler groups because I was made to feel like we had some kind of contagious disease. One of the most hurtful things I remember was sitting at a family gathering with members of my extended family that I hadn’t seen for a long time who had come to visit from far away and they actually took their ward of kids away as if they would get infected. I was so hurt and upset. But when I look back now with the wisdom I’ve acquired over the years, I’m glad they did this. I’m glad the people who shunned us in one environment or another did so because there was an infection to be had. We weren’t going to infect anyone but I’m glad they did not infect my son with their prejudices and warped outlook on life. We weren’t the ones with the problem…. they all were. My son’s deafness did not need FIXING. People just need to be more AWARE!! I thought about Joshua’s early days and all that he went through and we all went through as a family. Often times in those early years of his life, people would pity me and say how sad it was and how sorry they felt for me and him and my family. Thing is though, I had the benefit of being on autopilot then. We were so consumed with hospitals and appointments that there was no time to stop and think about any of it really. I remember when I was pregnant with him, I sat staring out of my parents’ living room window deep in thought and my father enquired as to what I was thinking. I was worrying about the kind of life I would give him. I was young and didn’t have very much money, but I dreamed of being able to send him to the best schools and being able to give him the best in life and I knew I was in no position to do so. Little did I know, I had much bigger things to consider than what money could buy. We all take it for granted that we’ll bear healthy, happy babies and in those early days in that whirl of hospitals, suddenly the last thing I was worried about was whether I’d be able to buy him the latest toys. At 3 weeks old, First Born had his first surgery. We nearly lost him owing to his heart murmur. But he came through fighting. By the time he was 2 months old, he had cataract removal surgery in both his eyes and contact lenses were fitted. His prescription then was +42 in both his eyes. The eye that they operated on secondly though had developed a scar in the pupil and was not getting enough light stimulation, and on top of having to ensure he had clean contact lenses that often popped out because they were so thick, he then had to have his “good eye”, the one he could see out of, patched so that the weaker eye would get light stimulation. It was horrific. This tiny baby had been given sight and then had to have it covered with a patch to give his weak eye a fighting chance. On top of all of this, he had to contend with his body-worn hearing aids as well. Twice a day, sometimes more if his lenses fell out, we would have to wrap him up in a blanket really tightly and force his eyes open to put in or take out his lenses. He suffered numerous eye infections, trauma from being wrapped and what I call nothing less than “abused” in the process, and still the appointments rolled in. I’m not sure he ever had a stretch of a week of just normal in that first couple of years. We always had to be in some waiting room for hours somewhere. The thing is though, so many people felt so sorry for me. People from this outside world that is. In there in the hospitals. That’s a whole different world. I was also introduced to many other different types of mother toddler groups through the hospital and through my Health Visitor. When people said they felt sorry for us, I did not. Behind those walls in the hospitals I met other people. We were lucky compared to them. My baby boy may have been deaf and had some serious sight issues but he was alive and well and at home. I met so many people who were, in fact, confined within those walls because their child was terminally ill or so ill they did not even know when they would be able to bring them home. I met people at groups whose beautiful children were dying slowly though diseases that were going to rob them of a chance of even seeing adolescence. So how on earth could I feel sorry for us? We were blessed. We had life. I didn’t grieve, I was in a better place than them. Ignorance can be bliss however. It was probably a mistake not to grieve and take it on the chin. Being my first baby, what I had at home was normal for us. We had our own way of communicating and babies don’t talk, so First Born was making all the right noises and I was oblivious to, or had hidden away, the fact that he couldn’t hear me. There was so much else to deal with, the contact lenses, cleaning them, the patches, the physiotherapy and occupational therapy, all the other ways of stimulating him with lights and textures etc. As long as he was making those noises, then I was able to forget about the deafness. My mother had started taking him to a mother toddler group run by our local deaf centre whilst I was at university. He had been going with her for a few months and was toddling by this stage. If I recall correctly, he would have been about two. She called me and told me of the Christmas party and what time to bring him there and meet her. I went up there and remember clearly walking through the double doors. I expected tinsel and decorations and a Santa Claus and chattering and music. Only, there was no sound. It was a world I’d never seen. I was horrified. I didn’t know if I could cope with this. Just when I thought I’d got to grips with the contact lenses and the patching, a curve ball had been thrown at me. I was the parent, I was supposed to be bringing my son to this gathering when all of a sudden I realised that I wasn’t bringing him. He was bringing me. He knew everyone. He was in his comfort zone. He ran in and SIGNED at someone and they were all signing back at him. Adults came up to me and were signing furiously at me and I didn’t know what to do. He may have been in his comfort zone but me…. I was completely out of my depth and I looked at my little boy and for the first time in that two years, I realised the reality of his deafness head on. I went home that evening and I cried. I finally, for the first time, cried for his loss. I was drastically upset but I never told anyone. How could I now after all this time suddenly say it was a problem. Quickly over the coming months as I observed First Born integrating into the deaf world I realised something though. This was his comfort zone.This was his world. He was happy here and the words of a woman form the Department of Sensory Needs who came to see him when he was just a few days old rang though my head. She appeared on my door step unannounced and said, “I am here to see him”. (Like Jesus). She barged her way into his room when I told her he was asleep and she stood there looking at him… Honestly… it was like a little Messiah was born when he came into the world. I had to quickly ask her to leave though. She stood there and then turned to me, looked me right in the eye and she said, “He’s not yours you know. You’re just borrowing him. He belongs to the deaf world”. WHAT? WHAT? What was this woman telling me about my days-old baby? What on earth did she mean he wasn’t mine? Of course he was bloody well mine. I felt so threatened. Like she was going to run away with him and give him to the deaf. I think subconsciously this may have even been why I blocked out his deafness in those early days. In retrospect, as insensitive as she was about saying this, I realised, for the first time at that Christmas party at the local deaf centre, that he did belong to them. Over the years it has become clearer and clearer to me that there is a divide between the deaf and hearing world and though we are all of one family, my son and the rest of my family are of different worlds. 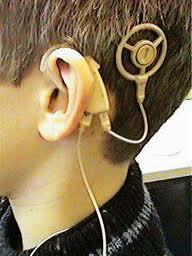 Hence why of course, I gulped a bit when he brought up Cochlear Implants with me and I had to check if he wanted one. We had the choice of letting him have one when he was two and we declined on his behalf. It has always haunted me that he might say we made the wrong choice for him. So last night I was relieved when he said that he was, “impressed with everything as now that society acknowledge of us deaf people, giving us a support all we needs”. This is the video he brought to show me over breakfast this morning. It impressed me even more. It does remind me though, that the collision between the deaf and hearing world is almost non existent to me now after all these years. To those who have no need to be around the deaf regularly, there is a huge divide… and for the deaf who live in this hearing world, they feel the divide too… but it’s nice to know that with the help of organisations like SENSE making society more deaf/deafblind/blind aware, less inhibited and more accommodating, that people like my son feel more accepted in this world we live in. I haven’t touched much on my son’s sight problems in this blog post as it is his less profound loss compared to his hearing. However, he’s considered legally blind. We’re lucky though, he operates at a level that would make most people think that he just wears really thick glasses. There are so many other people out there that have a loss of sight as well and can’t use sign language the way he does and depend on other means of communication like touch. This takes so much more skill to teach and learn, and funding is needed to help people who communicate in this way as well as to help them with the day to day tasks they undertake. I refer back to the reasons for these recent postings which is to make society more aware of the deafblind like my son and the 100km walk I’ll be doing on May 12/13th to raise money for SENSE, the deafblind charity who have helped my son and others who have much more profound losses than he does. Please click on my Virgin Money Giving link to pledge even just a few pounds so that I may raise money in order that SENSE may keep helping people like First Born and continue to give, not only them but their families, the support that they need. Organisations like this offer practical, emotional and sometimes even financial support to families who, without them, may not be able to cope or give their child or family member the best help or support they can. They have been an invaluable resource to us, please help them to keep being an invaluable resource to others as well. To those of you who are following this story, thank you. And a big thank you to those of you who have been pledging money and sending kind words of support and encouragement. I only walked a few miles today to “ease myself into my training programme” and I’m EXHAUSTED. Your words of encouragement and donations will be what keeps my legs moving when I take off on what I hope will be a warm and sunny morning! As a footnote, I just wanted to add that, as First Born developed his relationship with the deaf world, my wounds of his deafness hitting me healed quickly. I didn’t feel sorry for myself before, I felt sorry for him. In that instant, at that Christmas Party and for a few months afterwards, I did feel sorry for myself. But I stopped feeling sorry for him and for me because, when I looked at him with his deaf peers, I realised that neither he nor any of them felt sorry for themselves and if this little boy who had been thrown a bag of lemons didn’t feel sorry for himself, why should I feel sorry for me? That was not my right! He gave me the strength to carry on. Also, if you have no idea how the deaf and hearing world can collide and the impact it can have on a family or a deaf person, the whole reason this conversation came up with my son was because we were discussing a TV series which came out recently about a couple of girls switched at birth. One of the girls is deaf and grew up in a deaf friendly environment and is then thrown into a world with no experience of hearing loss. It is very interesting to watch from the perspective of gaining insight into how the two worlds can collide. Have a watch if you can!! Posted by singlemotherstories on March 19, 2012 in March 2012, The WALK!